Thanks so much for stopping by today and letting me share July’s edition of OLD NEW BORROWED COOL with you! Can you believe it’s JULY and half of 2013 had gone by already?! What’s more, for us here in Kentucky, almost half our summer is gone as well! We’ve been crazy busy as I’m sure you all have with wonderful summer activities like barbeques, sleepovers, swimming….and SUMMER CAMPS!! Yes, I just said those two magical words! Between my all my boys, one, two or even all three of them have been at some camp or another pretty much every week. My youngest had three back-to-back and he’s VERY excited that this week is all his own – ESPECIALLY since his dad and two older brothers are at scout camp! That means he has his mama and his dog all to himself. I am pretty sure that’s a boy’s idea of paradise! He’s looking forward to doing things like sleeping in, having what HE wants for dinner, going to a matinee of Monsters University and Thursday’s 4th of July fireworks. Speaking of the 4th of July, he’s been saving up his money to buy fireworks of his own – things like sparklers and popper and whatever else Mom deems somewhat safe. He loves seeing everything decked out in red, white and blue (including our house) and insisted that we make some kind of patriotic craft this week. And THAT, my friends, is where this month’s Old New Borrowed Cool comes in! What is better than a two-fer, right?! Because my creativity seems to be at a halt with CHA prep work taxing my brain, I decided to head to my favorite inspiration source (you know what’s coming, right? 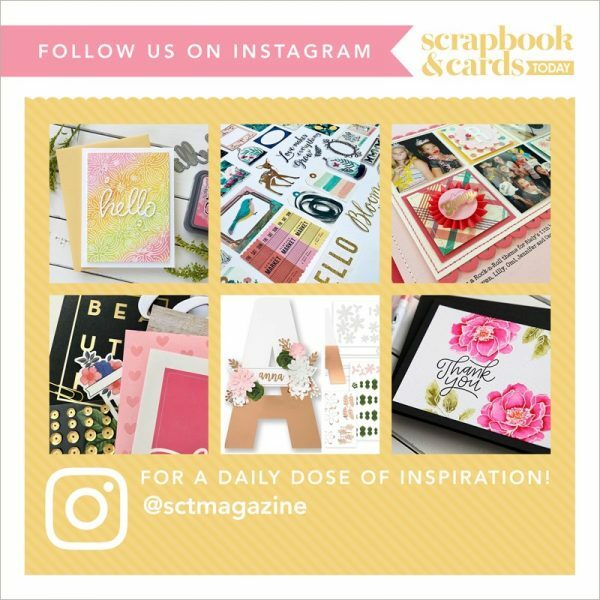 )…yep – PINTEREST! 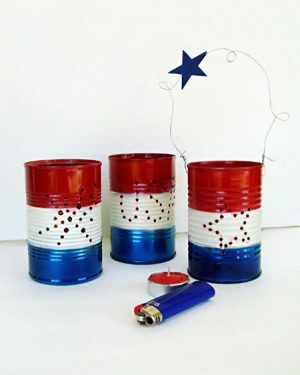 I looked up “4th of July” crafts and I saw the cutest little luminaries made from empty cans! “HEY!” I thought. “I have all the stuff I might need to make those!” And with that, I sent my little man off on a mission to round up all the necessary ingredients to get our craft on. OLD: My trusty, tried & true BIG BITE Crop-a-dile. How I love this thing. And when I remembered one of its original selling points was that it punched through METAL, I was stoked! NEW: Okay. I’m going to confess. There isn’t much new here unless you count my cans of beans and veggies. So I am. Totally. They were brand new. And now the contents of each can is now sitting in my fridge! BORROWED: A fun up-cycle idea from THIS POST on Pinterest. 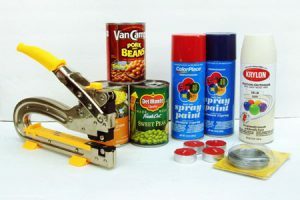 http://pinterest.com/pin/469429961129767577/ Oh, and my husband’s spray paints. Shhhh! Don’t tell him! 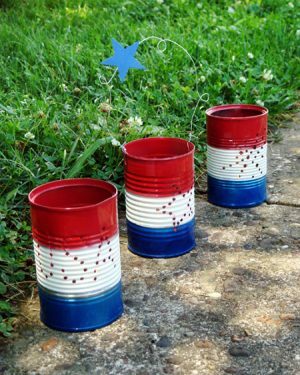 COOL: These adorable patriotic tin can lanterns that I am quite sure you can make with what you already have around your house, too! After cleaning and washing out the cans, my son and I set about to drawing designs on them. We did a star, a firework burst (he really liked that one) and a USA. But truly you could do anything from a Maple Leaf for Canada day to a daisy for general summer and everything in between. These would be SO cute for a party! After drawing the design, it was time for the hardest part of this project – the punching through the metal. While it wasn’t difficult, the can sometimes bends if you aren’t careful and the little shards that remain once you punch can go everywhere. 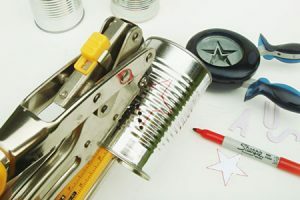 My big tip is to keep your design a bit toward the top of the can as the crop-a-dile can’t reach at the very bottom due to the depth of its punching arm. I also removed its feet so it would fit in the can better. Once the design is punched, it’s time to spray. I just cut a few plain strips of paper to wrap around the can and mask off where I didn’t want the paint to go and went to town. Repeat this step for each stripe and pretty soon you’ll have this…. I can’t wait to see what these look like at night! My guy is very excited about them and insisted I light them immediately though in the daylight you couldn’t see how cool they are bound to be! But it made him happy and that really was what this was all about! So now as always, it’s challenge time. Get in there and create something with your little monkeys! Make some kind of craft that they’ll be excited about! And just enjoy spending time with them. The summer goes by so quickly – soak it up!